A place where individuals may come to “buy” lightly used clothing at a very modest price. This store is open for everyone to shop and buy as they have need. Store hours are 9:30 AM – 10:30 AM on Saturday mornings. 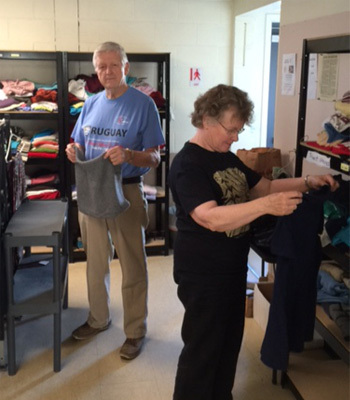 If you have specific questions or comments about the Clothing Bank, or if you wish to make a donation, please email Christ UMC with your comments and one of the Clothing Bank directors will respond to your inquiry. The breakfast is open to everyone and runs in conjunction with the Clothing Bank and is held each Saturday morning from 9:30 AM - 10:30 AM. There are a variety of meals served, from pancakes and sausage to eggs and bacon. Each breakfast comes complete with juice, coffee, and milk, as desired. There is no cost to the diners for the breakfast - it is provided FREE to all who come. Following the food, there is a worship time where we pray, sing, and here a special message! If you have specific questions or comments about the Saturday Morning Breakfast, please email the Outreach Committee Chair with your comments.